Boston Handmade: My new Favorite Yarn…. I love love love yarn. 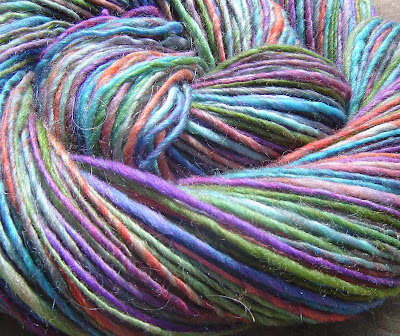 It’s one of those things – my fingers get itchy to sink themselves into it, and my heart races with excitement when I get within a mile of a yarn shop. I especially love wool, which is interesting because I used to have a wool allergy. I could never wear wool, and being near it made me sneeze myself silly for 10 minutes. I’m a great believer in overcoming allergies through overexpose. Please Note: this is my own extremely non-medical opinion. I have no idea if there’s proof that this method is valid, but it worked once before for me with cats! Anyway, I’m happy to say, since I’ve been surrounded by wool and have been working with wool daily for almost 2 years now, I’m confident that I’m over my allergy. I’ve also almost lost my sense of smell, but that could be completely unrelated. – hand spun and dyed by Kristie Haynes. It’s called Coral Reef, and it’s absolutely exquisite. Every stitch is so exciting as I watch the different color combinations come together. I spent the weekend knitting a bowl, then a bowl for myself, then another type of bowl – then I was out of yarn! Thankfully, she’s dying me up another bunch of skeins. I’m on the lookout for a great sweater pattern to make for me!